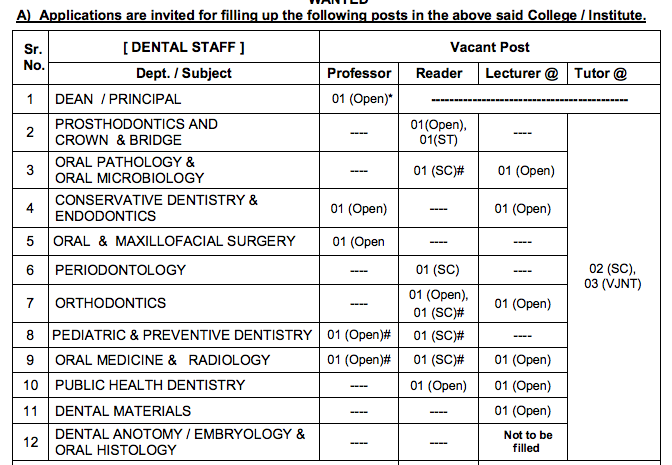 A) Applications are invited for filling up the following posts in the above said College / Institute. a) A BDS degree of an Indian University or an equivalent qualification. b) Post-Graduate qualification / Diplomat of National Board in the subject. 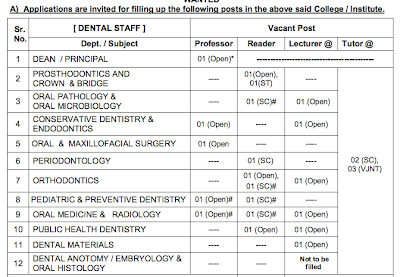 c) Experience as Professor for not less than 5 years in a Dental Institution. c) 5 years teaching experience as Reader. c) 4 years teaching experience as Lecturer. with at least one year experience. 1) Reservation for Ladies and physically handicapped persons is as per the Govt. rules. certificate and also recent non-creamy layer certificate, wherever applicable. are domiciled in the state of Maharashtra only. experience shall be considered up-to earlier day of the interview. be applicable, from time to time. year, as per respective council’s norms. 7) Pay Scale is as per rules. along with attested copies of certificates and experience certificates.